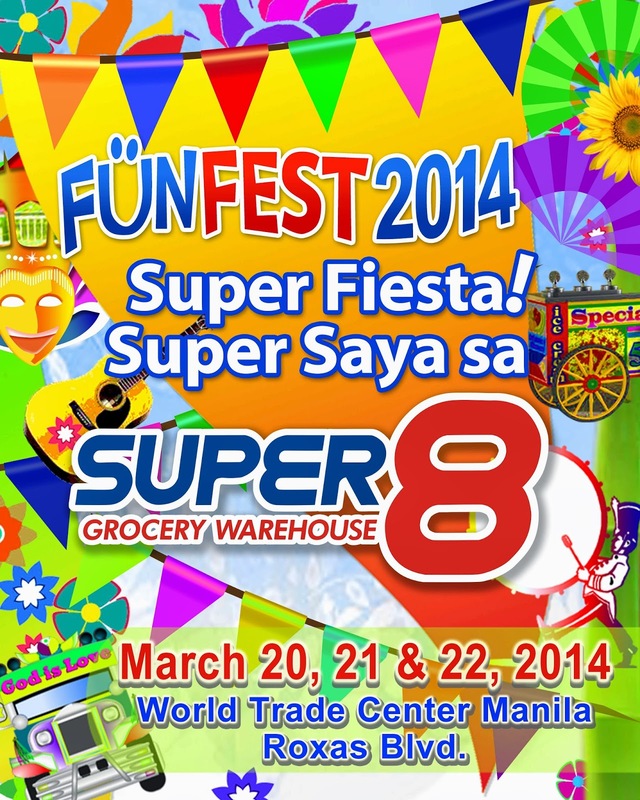 Super 8 Grocery Warehouse is holding Funfest 2014, their annual sale event that offers guests abundant shopping deals, exciting activities and fantastic freebies. Loyal customers and the public get to enjoy big discounts from various exhibitors with all grocery items on sale, some by as much as 30 percent. Not to mention a lot of exciting activties, performances and celebrity appearances. This year’s theme is “Super Fiesta, Super Saya sa Super 8!” which replicates the vibrant fiestas the Philippines is known for. Performances by the award-winning Sindaw Philippines Performing Arts Guild and the Buganda Drumbeaters & Dancers will add credibility and a festive touch to the atmosphere. March 20 and 21 are reserved for Super 8’s top customers and is by invitation only while the event is open to the public on Saturday March 22. On March 22, the event runs from 9:00 am to 6:00 pm and admission is free of charge. What makes the event even more exciting is the fact that Super 8 Grocery Warehouse is raffling off Two (2) Toyota Wigo’s --- Toyota’s latest product offering that pushes fuel efficiency, style and functionality into high gear, four (4) 100cc PMR motorcycles, sixteen (16) iPad Minis, Super 8 gift certificates and many more prizes to lucky visitors of Funfest 2014 so be sure to be there! Funfest 2014 is happening at he World Trade Center in Pasay City from March 20-22, 2014. Major sponsors include Procter & Gamble Distribution Philippines, Universal Robina Corporation, Mondelez Philippines, Inc., Peerless Products Manufacturing Corporation, Nestle Philippines, Inc., Coca Cola Philippines, Inc., Unilever Philippines, Inc., Colgate Palmolive Philippines, Inc., Del Monte Philippines, Inc., Johnson & Johnson Philippines, Inc., NutriAsia Inc., Regent Foods Corporation, Alaska Milk Corporation and Century Pacific Foods Inc. Official media partners are 90.7 Love Radio, Yes! FM 101.1, 96.3 Easy Rock and DZRH.